Brussels, 11 October, from 8:30 to 10:30 a.m. This year, the EU is witnessing intense debate on the future priorities of the Union – and on its next multiannual budget, covering the period 2021-2027. The round table aimed to foster innovative ideas for the enlargement and harmonisation process which would allow the EU to use the growing power of cities in international cooperation. In this round table, the exchange centred on incentives or tools which could encourage city-to-city interaction and thereby improve exchange and dialogue between citizens as well as institutional cooperation between Member States and enlargement countries in the future. The event started with five-minute pitches by Onur Eryüce, Annegret Warth, Banu Pekol and Daphne Keilmann-Gondhalekar, which could be implemented in the upcoming budget covering the period 2021-2027. Following these pitches, Commission officials, members of the European Parliament, members of the Committee of the Regions, and city mayors had the opportunity to respond to the proposals and discuss possible ways to achieve them. Dr Banu Pekol, who works in preservation and management of cultural heritage, presented her pitch on how cultural heritage connects cities and generations, feeds both our sense of belonging to a community and a sense of solidarity. She explained that cultural heritage captures the multiple layers of a city’s identity: local, regional, national and European. By investing in heritage, it is possible to advocate the positive and cohesive power of our shared cultural values and to promote responsible citizenship towards our past and future. Dr Banu Pekol remarked that heritage preservation is not only a physical practice but also an instrument of cultural diplomacy. She stressed that by using the momentum of 2018 as the European Year of Cultural Heritage, cultural heritage should be recognised as a strategic priority in the upcoming policy programmes and in the EU’s financial framework. Onur Eryüce, in his pitch, explained that cities have acquired a transformative power for Europe through collective actions. The EU has recognised the rise of cities by reforming its institutions and urban policies. The European Commission employs successful policies and tools on decentralised cooperation at different levels. However, the potential of city-to-city cooperation between EU and candidate countries is not adequately exploited. Onur proposed the development of a multi-country financial programme to co-finance projects and thematic networks linking cities from all the EU and candidate countries during the EU’s 2021-2027 budget period. Onur explained that this kind of cooperation between the EU and candidate countries would help to bring citizens and different cultures, political and economic systems closer together. Annegret Warth, an educational scientist and youth researcher with a focus on Turkey, looked in her pitch at the potentials of European mobility programmes for local governance in the youth field. She remarked that while youth work institutions are central partners for European cooperation, this does not necessarily seem to be the case for municipalities. She explained that some policy initiatives in Europe have lately created municipal networks in order to incentivise mutual exchange in the field of youth policy. However, these measures are neither part of a comprehensive European programme focusing on municipalities nor accessible for municipalities from EU enlargement countries. Annegret Warth supports the idea of establishing a programme within the upcoming EU financial framework which would co-finance projects and thematic networks between cities from the EU and candidate countries especially in the field of youth and social policy. She emphasised that such a programme should be linked to existing youth policy measures provided by the EU Council of Europe youth partnership and Erasmus+. Daphne Gondhalekar is an urban planning researcher working under the Chair of Urban Water Systems Engineering at the Technical University of Munich. She specialises in integrated urban planning. This refers to coordinated planning for multiple sectors, particularly the water, energy, food provision, transport, and solid waste sectors. Cities today commonly consume more resources than their regions can provide, contributing to environmental degradation and climate change. Conventional urban planning usually does not consider potential synergies between sectors that can enable resource use efficiency and conservation. Also, existing systems such as centralised sewers are often very resource intensive, using a lot of water and energy. Integrated urban planning can help cities with limited capacities to streamline their activities. Particularly wastewater is a key resource for integrated urban planning: water reclamation with resource recovery can yield various products, including water for various uses like irrigation and toilet flushing, bio-energy, and nutrients for organic fertiliser for food production and improvement of soil quality. Hence water reclamation with resource recovery can contribute to water and energy conservation as well as to achievement of the SDGs. City-to-city cooperation between EU and candidate countries is proposed to improve capacities on integrated urban planning through knowledge transfer of best practices and to bring citizens and different cultures, political and economic systems closer together, thereby supporting EU enlargement policies. Global Diplomacy Lab is a platform for exploring a new and more inclusive diplomacy under the patronage of German Federal Foreign Minister Heiko Maas. Bosch Alumni Network facilitates international collaboration and cross-sectoral exchange among its members via clusters such as Culture, Social Innovation, Sustainable Living Spaces and Governance. FES Turkey has been promoting cooperative dialogue between committed people and civil organisations. FES supports a social, democratic and competitive European integration process. 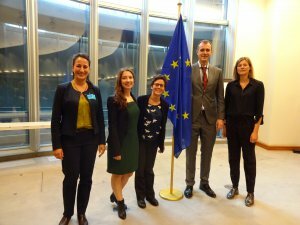 SODEM is a municipalities association from Turkey aiming at initiating and expanding dialogue between its member municipalities and their counterparts from Europe and all around the world. Onur Eryüce has worked to strengthen political and cultural ties between Turkey and the European Union in defiance of a challenging political environment. In 2011, he played a pivotal role in the foundation of the Association of Social Democratic Municipalities (SODEM), which was set up to foster strategic partnerships among Turkish municipal leaders and their European counterparts, thus bolstering the position of Turkish municipalities in the EU accession process. Under Onur’s management, the organisation has grown to 130 member municipalities, representing more than 15 million people, and has successfully contributed to EU-Turkey collaboration on issues at the municipal level. He is responsible for setting up and furthering political, social, cultural and economic dialogue between the member municipalities and their European and international counterparts. Banu Pekol is a founding member of the Association for the Protection of Cultural Heritage, where she continues to work as a consultant for architectural conservation projects of non-Muslim heritage in Turkey. She worked as an assistant professor of architectural history and conservation at Özyeğin University, Istanbul, and has taught undergraduate and graduate courses at the Istanbul Technical University and the Netherlands Institute in Turkey. She won the Salzburg Global Seminar Fellowship on Conflict Transformation through Culture: Peace-building and the Arts; the Association Villard de Honnecourt for the Interdisciplinary Study of Technology, Science, and Art Award; a Hellenic Ministry of Culture Grant; the Otto Gründler Award; and grants from the Stavros Niarchos Foundation and Bodossaki Foundation. She has worked as an advisor and specialist on EU and US-funded projects and continues other activist projects. Dr Daphne Keilmann-Gondhalekar is a US and a German national with a strong interest in urban environmental issues. She is an urban planner currently working at the Technical University of Munich, Germany, as Member, International Expert Group on Earth System Preservation (IESP), Institute for Advanced Study and Visiting Scientist, Chair of Urban Water Systems Engineering. She holds a PhD in Urban Planning from the University of Tokyo, Japan (2007), a Master’s in Architecture and Urban Design from the Swiss Federal Institute of Technology Zurich, Switzerland (2002) and a Bachelor of Architecture with Honours, from the Mackintosh School of Architecture, University of Glasgow, Scotland (1998). She has worked as a Postdoctoral Associate at the Department of Urban Studies and Planning, Massachusetts Institute of Technology (MIT), Cambridge, USA, and as a Senior Researcher at the Center for Development Research (ZEF), University of Bonn, Germany.